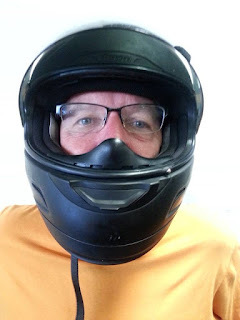 Sometimes, I drive my motorcycle to work. It’s about a 10-minute trip--longer if I’m lucky. That’s one of the thing about bikes. You never really want to get where you’re going. This office is in a very densely populated part of Toronto known as Little Portugal. And about one month ago, when I neared the office, traffic locked up. Serious mid-city congestion. Something not good was happening ahead. I saw the reason for the congestion. A major intersection was ringed off with police tape. Several cruisers were sitting with their lights flashing. A young woman—about my daughters’ age—stood at the corner. I asked if she knew what was going on. She didn’t, but she did let me know this mess meant she was going to be late for work. Alice (foreshadow much? ): “Not far, Queen and Sorauren." That’s about 10 minutes away from the office, pretty close to my house, actually. I loved her attitude. I handed her my spare helmet and off we went. Best part: The ride took us back towards my house and then down the aforementioned Sorauren Avenue, a street that my very own wife Helena (who I should add sometimes introduces me as her first husband) must drive along every morning en route to work. You couldn't tell by looking, but underneath my smoked visor, I was petitioning as fervently as I could that Helena would pull out just in time to catch sight of me, maybe turning the corner--in the opposite direction from my workplace--with a mysterious woman holding on for dear life. If I did cross Helena's path, I would pretend to not see her. And then later that day, if she asked about it, I would deny everything. We’ve been married a long time. It’s good to add a bit of spice to things—even if it’s all in my head. However, my bike must be too loud. My prayers did not get heard. No wife. Alice and I arrived at Queen and Sorauren. She got off the bike and asked if I’d like a doughnut for my trouble. Did I forget to mention she worked at a yuppie designer doughnut shop? 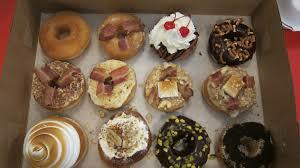 And that said doughnut shop is called…trust me I wouldn't make this up: Glory Hole Doughnuts? I told Alice I appreciated the offer but couldn’t very well carry one on my bike, so into work she went and I rode away. I met Alice again three hours ago. For reasons that I won’t go into here except to say they’re all about my bike’s mechanical condition and not my mood, I wanted to take a longer route to work. and it took me past Alice’s shop. Coincidentally, some mornings, I find it fun to bring snacks for my co-workers; my go-to sweet is a box of Timbits. You get 20 for about $5 and everybody wins. As my ingenious Polish niece Aga once observed, people who eat sweets in the morning are probably happier. So this morning, instead of Timmy’s, I visited Glory Hole. Behind the counter: Pal Alice! Alice—very quick on the uptake—“Hi. Can I help..hey it's you!" She introduced me to her co-worker and then helped me choose some doughnuts for this office. I know a few of my co-workers are vegan and for some reason, I knew Alice’s joint would have something for them. 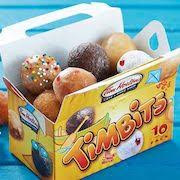 And that’s why, instead of 20 Timbits, my co-workers this morning shared delights from the Glory Hole. And name notwithstanding, they were in fact the most delicious doughnuts I’ve ever eaten in my entire life. Aga’s right! The key to happiness is something sweet in the morning. You just never know what form it’s going to take.